Confession: TrustMovies is not on Facebook, either. He was, for a short while some years back -- until he realized that he was wasting incredible amounts of time being in touch with people he didn't care that much about and for whom he did not have the time or energy. So he severed all Facebook connection (he was never impressed with the site's so-called security measures, anyway) and will never return there. He does have a Twitter account and is easily reached by email or phone. (He also admits that the image he has retained of Facebook founder Mark Zuckerberg from that fine film, The Social Network, had a certain influence here, too.) Which is all by way of saying that when he saw the title of the new documentary WHY I'M NOT ON FACEBOOK, he knew he had to view it. You should, too. 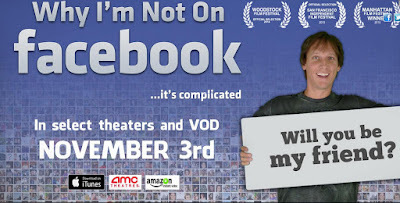 This is one of the best documentaries I've seen this year, and it is certainly one of the most necessary, as it holds up a mirror to both Facebook itself and to the American (and probably international) public and its current and ever-more life-deadening "quirks." 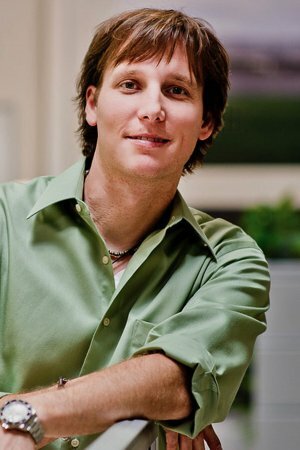 The film's creator and director, Brant Pinvidic, shown at left, seems like a cute, smart, energetic family man whose suspicions about Facebook are more than justified by the evidence he has amassed and then, along with his excellent lead editor and producer, Dean Shull, put together in such an intelligent, entertaining manner. The result is a film that will surprise you, even as it pulls you up short and makes you think, then think again. Along the way we meet the real Winklevoss twins, along with some of the folk Facebook has helped make "famous" (like the Pink Lady, below). We also learn how Facebook has become the leading Job-Finder of modern times (as well as one of the main job losers, too: a product of how stupidly its users use it). Mr. Pinvidic is careful not to demonize Facebook -- as his evidence piles up, at times his movie threatens to become instead a commercial for the site -- and he even creates his own Facebook identity (who is Steve Steel?!). The movie shows us how Facebook has helped catch criminals (often because they actually post on the site about their crimes: Ah, that ever-growing need for fame!). We meet one young high school girl who appears to be addicted to the site; her behavior here is so sad and awful that it practically demands an "intervention." And that matter of privacy? Well, as Pinvidic points out, even without Facebook, privacy these days is just about over. The film is full of humor and fun, too. At one point, our narrator wonders, Would Jesus have been on Facebook? Oh, wait: He already is. As the director reaches the home stretch, his movie really takes off. He addresses the psychology of Facebook lovers, and by extension, the rest of us, too. His conclusion as to why Facebook has become so important so fast is extraordinarily on the mark, I think. I'll let you discover the explanation for yourself. (Hint: its simultaneous appeal to two of our most powerful emotions/needs.) That way you'll have to see the movie -- which is worth your time in every respect. The documentary, just 77 minutes long and worth every one of them, will open via VOD this Tuesday, November 3. And maybe in select theaters, too? (That's what it says on the poster, top.). Any way you can see it, this one's a don't-miss experience. I Loved your documentary. Very smart. Adorable! Well done. Some interesting things you brought up about security though. Also, about the people who stalk and rob homes. Thank you for documenting that. Thanks for posting your comment, Michaele. I hope the film's director, Brandt Pinvidic, sees it, too.